For the first time that I can recall, I didn’t know what today’s WOD was going to be, having not looked at the posted WOD online before traveling to Bridgeport. I was the first person to join the 6am session after the coach, Vinnie, opened the doors. I introduced myself and Vinnie asked about my background. I informed him that I was a CrossFit coach and that I specialized in endurance. He said, “Then you might not like today. We’re doing front squats and heavy kettle bell swings.” I have grown to truly enjoy squats of all kinds, and the front squat might very well be my favorite. After having attended only 3 sessions, I can confidently say that CFKoP is a great box! All of the coaches I’ve worked with have been great, and Vinnie is my favorite. I knew I liked him when I saw him carrying an orange Nike bag — the same one I own. In addition to knowing his sh!t, Vinnie swears (which I do indeed like) and has a great sense of humor. Our warmup consisted of a 400m run(! ), stretches, wall ball shots, pushups, and then a review of the front squat using a PVC pipe and the wall. Yes, the wall. I will most definitely use this technique the next time I coach squats. We were asked to team up and share a rack. I said, “Does anyone want to team up with the visitor?” Most had already paired with friends, but a woman looked at me sheepishly. I said, “Would you like to team up?” She replied, “This is only my second class since fundamentals. I’m sure you don’t want to team with me.” I said, “I’d be delighted to! Besides, we’re about the same height, so we should be using the same rack.” I introduced myself, and she told me her name was Alana. I did coach Alana, and she was very appreciative. She worked up to 75#. 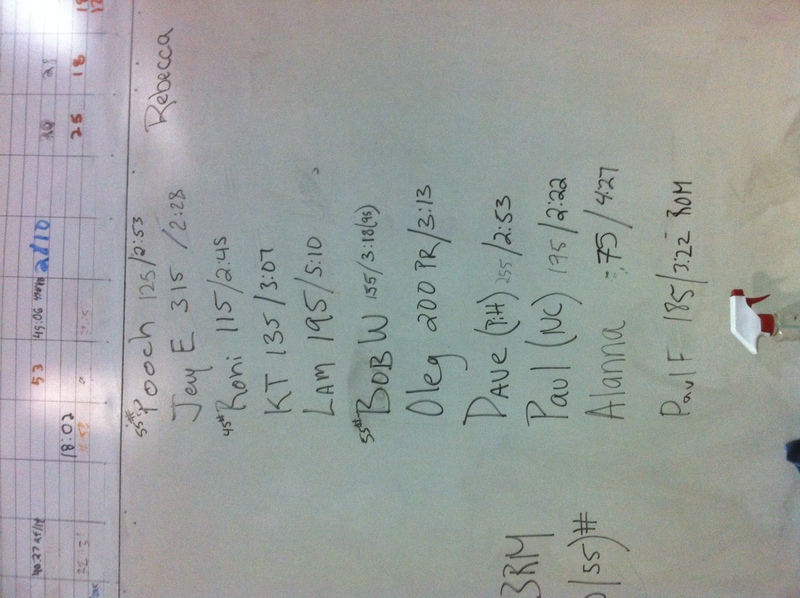 Alana wanted to go second, so I grabbed a 70# kettle bell, put 145# on the bar, and set my goal: all rounds unbroken. I asked Alana to count for me. 145# felt heavy by the 5th rep of the first round. I did complete round of 9 FS and KB swings unbroken, although it took me 2 swings to get the first swing overhead. The round of 7 was painful, and I was very tempted to place the bar of the rack after the 4th & 5th rep. I wouldn’t allow myself to do so, and did complete the round of 7 FS and KB swings unbroken. I rested an ever so brief moment before starting the last round of 5 FS. I really had to dig deep to complete unbroken and with proper form. As instructed by Vinnie, I dropped the bar after the last rep. I completed 5 KB swings and gasped “Time” at 2:22, the first to do so and the fastest of the morning sessions. I made sure to thank Vinnie and to praise his coaching abilities. I’m looking forward to WODding at CFKoP next and in upcoming weeks! ‹ PreviousWhat a difference a day makes.